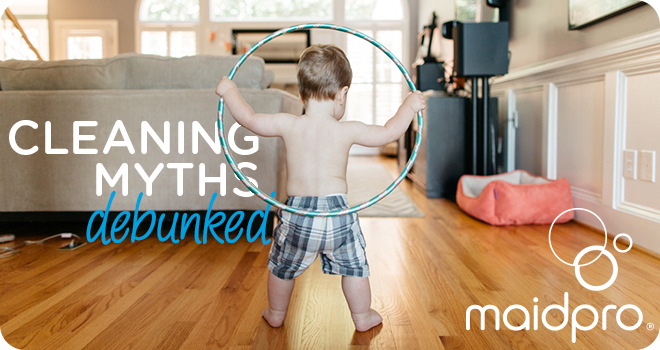 Myth #1 If a wood floor is shiny, it’s clean. FALSE Shine means a surface is smooth, not clean. Shine happens when light bounces off a flat surface straight back into your eyes. Dullness happens when light bounces in all different directions (much of it missing your eyes) because the surface is uneven due to scratches. While dirt can make surfaces uneven, pristinely clean wood floors will also appear dull if their finish is scratched or worn. Floors that are wet or oily (from oil soap) can shine beautifully and still be covered with dirt and germs. Myth #2 Plain water is best for cleaning wood floors. FALSE Body oils, dirt, and grit—all the things that make floors dirty—cannot dissolve or float in water, which means only dirt that gets pressed into mop fibers will be removed if washing with water alone. Everything left behind will get stomped into the floor, scratching and darkening the finish. Soap (aka detergent) is the only thing that makes oils, dirt, and grit float in water. Myth #3 Vinegar is the safest wood-floor cleaner. FALSE Old-fashioned soaps made from lye and fat were extremely slimy, sticky, and alkaline. Vinegar was added to mop rinse water because its acidity neutralized the alkalinity of the soap, helping to strip it off. Most people never understood why vinegar worked, so they kept using it even when modern detergents made vinegar unnecessary. Worse still, vinegar’s acidity softens polyurethane, slowly damaging the finish and making wood floors more susceptible to scratches. Worst of all, since vinegar lacks detergents, it leaves behind oils, dirt, and grit (just as plain water does) making the floor scratch even faster. Myth #4 Wood floors need oil soap for nourishment. FALSE While it’s true that antique wood floors were finished with wax—which allowed moisture to escape, thus creating a need to replenish it with oils—those antique finishes have not been widely used in generations. Most modern wood floors are sealed with polyurethane, which is a hard, waterproof coating. Using oil soaps on polyurethane is pointless as the finish blocks the oil from soaking in. Worse yet, the unabsorbed oil turns wood floors into slippery ice-skating rinks! Myth #5 Only expensive specialty cleaners make wood floors shine! FALSE Specialty wood-floor cleaners, through relentless marketing, have falsely convinced the public that they are the only effective option. The truth is that polyurethane-finished wood floors can be cleaned beautifully with ANY floor soap that meets three criteria: neutral pH, no harsh solvents, and quality detergents. Neutral pH means the soap will not soften the finish with strong acidity or alkalinity. Harsh solvents, such as those found in degreasers, will soften finish too. Quality detergents attach to grit and oils, forcing them to mix in water and enabling both the dirt and soap rinse cleanly away. MANY all-purpose floor cleaners meet the criteria for wood floors without the stiff price tags of specialty solutions. Fancy wood-floor cleaners also do nothing to make floors smoother. Rather, they rinse cleanly away without leaving behind any polymers or oils to fill in scratches that would help to make a damaged floor shine. So, instead of dishing out the big bucks for a fancy wood floor cleaner, simply select quality all-purpose floor cleaners that state they are safe for wood.